As a high school grad, jobs can be harder to find than you realize. It may seem like every employer is looking for a college education. The market is competitive; having more training and skills will help you find jobs. Without a college degree, how will you find the jobs that can create a career for you years down the road? In order for a company to be willing to give you a job, hiring you has to be a benefit to the organization. Tou don't have to have extensive education to be an asset to a business. Your goal needs to be to demonstrate to the employer that you have the skills, experience or the ability to meet their needs. As you consider applying for any business, consider what they need from the person that is filling this position. For example, a company is hiring a customer service representative for its main floor. They likely expect this person to work well with people, to be friendly, and someone that represents the company in a positive manner. Besides the sales skills you may need, these underlying qualities are very important for the hiring manager. Here are some tips to help you determine what the company's needs are. Can you already perform the required tasks? Experience performing the tasks related to the job is key. A company looking for someone to handle data input using specific computer programs is more interested in your skills than in an advanced degree. Do you possess the image of the company? A sales company is almost always willing to train individuals, but you have to fit the bill as a salesperson. For example, do you have a good vocabulary, are easy to talk with, look presentable and smile when talking to others? These are all qualities companies are looking for. Do you know how to work? It's important to work on obtaining a decent history of working, in any field. This should start while you are still in high school. Showing you are a reliable employee is also a good quality to have. It shows you are reliable and willing to do the tasks required. As part of the process of finding a job that fits the bill you require, you also must consider showing off these skills. 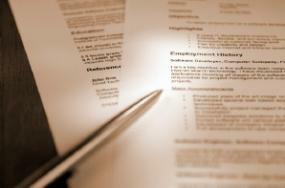 You've uncovered your skills and experience, now get it on paper in a professional manner so that it shines for you. In your resume, include more information about your work experience. Even small jobs like babysitting and part time positions will be incredibly important. Highlight the skills you learned there, such as how to work with others, how to be a team player, and how your gained responsibility. Since your work experience may be limited, play up the qualities you gained. Include information about other areas that have made up your life. If you played sports, talk about awards. If you took any educational courses outside the normal requirements that could pertain to the job, include those here. Those who were enrolled in vocational school during their high school should play up this educational experience, too. Putting it all together is important. Be sure you stand out in your search for high school grad jobs as the best person for the job, even if you don't have a college education to hold on to. Are you looking for the right types of jobs? Many of the job sites online have plenty of jobs available for high school diploma and GED candidates. Check these.